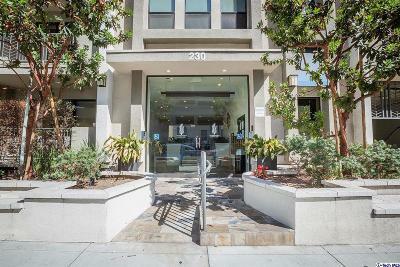 You are looking at a beautiful condo which is located blocks away from the famous Americana and the Glendale Galleria. The unit has laminated flooring throughout and features 2 bedrooms and 2 full baths. The stunning entrance makes its way to the spacious living room combined with the dining area and a balcony. The kitchen features gorgeous granite counters, and stainless steel appliances. The master suite has a walk-in closet and the bathroom has a double vanity. It also includes a gated parking garage with 2 assigned parking and 2 storage spaces. The community also comes with an open courtyard. Urban living at its best! Building was built in 2010 but finally completed in 2013. This lovely condo is just waiting for its next lucky owner!